Worried that Modern Warfare 2 developer Infinity Ward is holding content back from the game for the recently-announced DLC map pack? Worry no more - apparently, the developers "haven't even begun thinking" about it yet. 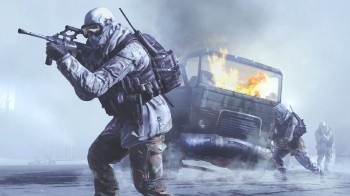 When we first reported that the Monster Modern Warfare 2 map pack was being planned for Spring 2010, there were some who took the news as indication that the proverbial sky was falling. Clearly, Infinity Ward had already made all these maps, and the company was just going to withhold them from the final product in hopes of making some more money, right? How greedy of them! "I think you might be confused by that. We haven't even begun thinking about what our DLC will be, Let alone finish any. NO DLC will begin development until the entire game is finished and certified." Of course, given that CoD: Mewtwo comes out in November and at the earliest, "Spring 2010" means March, cooler heads might have logically worked out that this four-month period would probably be used for designing, building, and testing the maps in question. So this really shouldn't come as a surprise. For everyone else, though, here you go. Assuming the man's telling the truth (and I can't see any concrete reason to doubt him), everybody can stop playing Chicken Little. Capice? Good.